* Ten new supervillains, based on the Biblical plagues of Ancient Egypt, including the deadly and mysterious Death Angel. * A complete supporting cast, including a novice superheroine, retired superheroes and villains, they mayor of Freedom City, a slum-lord, and a Voodoo priestess... and that's just for starters! * Information on integrating the adventure with Freedom City's Golden Age era. 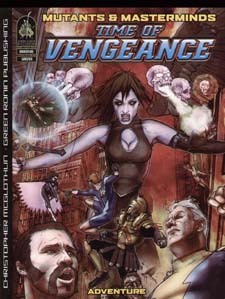 Time of Vengeance is a complete Mutants & Masterminds adventure in four acts, perfect for putting a new team of heres into the spotlight in Freedom City and giving them the opportunity to save the city from a disaster of truly Biblical proportions. Freedom City, beware! The Time of Vengeance is at hand!